Star Lotto is an excellent game for anyone who likes the lottery, and that’s everyone so everyone will enjoy playing Star Lotto! There’s nothing more exciting that picking your numbers and watching those balls drop to see if you’ve won the lottery and changed your life forever! This is how every spin in Star Lotto will feel and the best thing about this game is that you can really win a life-changing sum of money by scoring the Star Lotto Jackpot! It’s a totally unique slot, unlike any other, and if you enjoy something different then this is right up your street! If you’re a fan of Novomatic slots, such as: Book of Ra Deluxe, Lucky Lady’s Charm Deluxe or Red Hot Repeater, then you should definitely give this game a try! This game takes a while to get to grips with, but once you do, you’ll love it and really enjoy spinning these reels! There are four different slots in Star Lotto and you can choose to play only on one, two, three or all four of them! To choose to activate the set of reels, all you’ll need to do is click on them, or vice versa if you’d like to deactivate them. Each set of reels is made up of 6 reels and each reel has the numbers 0-9 on it. At the bottom of the screen, you have your set of reels, also with the numbers 0-9 on them, which you can adjust before each spin (except when you’re in autoplay, the numbers you choose will stay fixed until you exit autoplay mode). You can choose any combination of numbers you like – just like you do when you buy a lottery ticket! There are three different types of wins you can get in this unique number-themed slot game. The first and most simple of these types of wins is the ‘Matching First’ win. For this win, you’ll need to match your numbers to a reel – in order! So, if the numbers you chose were 123456, you’ll need to match them on a reel in that same order, from the first to the last. Each number you match (in the same order) will give you a payout – the biggest of which is if a reel also matches 123456! The second type of win is the ‘Matching Any Order’ win and this is a little more flexible but offers lower payouts. The ‘Matching Any Order’ win will pay out if you match between two and five of your chosen numbers, on a single reel, in any order. The third type of win is the ‘Matching Same Digits’ win and this type of win doesn’t involve your chosen numbers. If any reel spins and lands with four or more matching numbers, you’ll get a payout! If it’s four or five matching numbers, those matching numbers will stick and the other reels will spin to give you a bigger chance of getting more numbers! The jackpot in Star Lotto is also a major reason why so many people love this game. You don’t have to do anything special to win this jackpot – you just have to spin the reels! Every spin has the same chance of winning the jackpot so you could be awarded with the amount at any time! 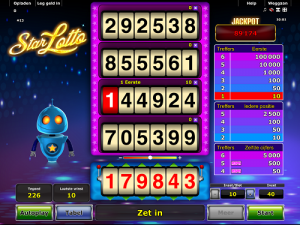 The jackpot amount will be clearly displayed at the top-right of the screen throughout the game. It’s a common progressive jackpot, so it keeps getting bigger with each spin, and the final amount you win will depend on your bet amount! As already mentioned, you can play Star Lotto in autoplay mode when your fingers get tired of clicking – no repetitive strain injury, please, just wins! You can also alter your bet amount in Star Lotto slot game by choosing the number of sets of reels you want to have active, as well as the amount you want to bet on each of those sets of reels. The minimum bet per ‘slot’ is 0.01 so if you’re only playing on one set of reels then the minimum bet you can play with is 0.01 per spin.